Publicity Strategy, or Real Marketing? When is Publicity Good or Bad? 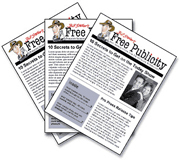 Do you have a customized media list to distribute your press releases? Are you using a public relations agency, or do you submit your press releases through a PR distribution service? It doesn’t matter what method you use, what matters is your publicity release or article reaches the reporters or editors that relate best to your industry. You need to target the right media. Using a general, catch-all list will not help your publicity campaign move forward. So what is the solution to reaching the right media? I read an article called “Guide to Creating a Media List for Your PR” that has many of the answers. If you don’t get a chance to read the article, I’ll give you a short review of what that author suggests. 1- Purchase a list. There are companies that provide media lists for sale. You can start looking at Bulldog Reporter’s Media Base, or PR Essentials Company. Another well-known name in publicity services is BurrellesLuce. 2- Distribution Service. Several companies provide distribution of press releases. A few of them are: PRWeb, although a free service, to get full distribution, you will need to subscribe or upgrade from free to fee. eReleases and Advanced-PR are two other companies to consider. Each charges a fee. Another public relations service for distribution is 24-7 Press Release. They also have a fee. 3- Create your own custom list. This is good for pr clients or small pr firms that need to distribute locally, or in limited industries. Try NewsDirectory.com, or Yahoo! News Directory. If you want to really get noticed, then you need to do more than just send out a press release or two. It requires an on-going effort. It requires hiring a public relations service company who can develop, write and distribute a full campaign. Did I mention that’s what we do? We are here to help you meet your publicity goals. Call George Carson today. He’ll get you noticed!